Renaissance Downtowns is a nationally-renowned and exclusive leader in large-scale unified community-driven downtown revitalization. Our success in securing $12 billion in downtown development agreements among several communities is centered on our Unified Development Approach (UDA). The UDA is a collaborative, public-private partnership-driven framework that brings together disparate groups of a community to collectively transform their downtown into a vibrant destination, adhering to the triple bottom line of being economically, socially and environmentally beneficial. Please join us for the 15th Annual Long Island Smart Growth Awards Friday, June 10th from 11:00am to 2:00pm at the Crest Hollow Country Club. This annual event will showcase the best in class of real people and projects that represent the transformation of our downtowns and investment in infrastructure for Long Island communities. These last few years has shown tremendous progress with over 12,000 units of transit oriented housing approved, over a billion dollars of Federal and State funds invested in our sewage treatment plants and nearly 60 communities working on varying placemaking principles of Smart Growth. 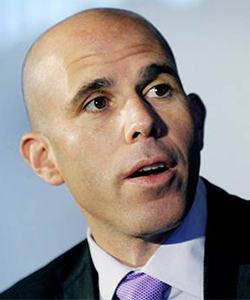 We have received over 40 deserving nominations and the winners start with a Regional Leadership Award to Scott Rechler , Chairman and CEO or RXR Realty for his progress in and longstanding support of creating mixed use, downtown destinations on Long Island. The groundbreaking for Garvies Point in Glen Cove is imminent and puts an exclamation point on his leadership. The project and organizational honorees have just been awarded and include Hon. 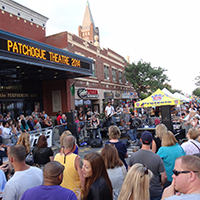 Don Barbieri for walkability in New Hyde Park; Alma Realty Corp & the Village of Valley Stream for a mixed use project in Valley Stream; Conifer Realty & Town of Babylon for housing choices in Copiague; Patchogue Chamber of Commerce for “Live after Five” in Patchogue; Town of Islip & Greenview Properties for a Pedestrian Plaza in Bay Shore; LI Building Trades Council & LI Federation of Labor for job development; Lalezarian & Village of Mineola for two redevelopment projects in Mineola; Beechwood Organization & Village of East Rockaway for a waterfront TOD in East Rockaway; Bartone/Terwilliger & Village of Farmingdale for a TOD in Farmingdale, the Gitto Group & Village of Port Jefferson for a TOD in uptown Port Jefferson; and East End Arts and the Westbury Arts Council for creating a sense of place providing arts, music and culture in our downtowns. Our keynote speaker is NYS Comptroller Tom DiNapoli. 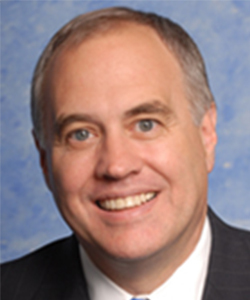 Comptroller DiNapoli works with local municipalities to keep them financially healthy while he has been a fiscal watchdog and steward of New York State funds. As a former Long Island Smart Growth Award winner and advocate for local communities up in Albany we look forward to his economic message. 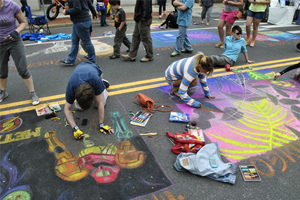 The event is annually attended by a broad array of community, government and business leaders. Last year's event featured over 900 guests so secure your spot now! The Sponsorship levels for the event remain the same at $2,000, $5,000, $10,000 and a lead sponsorship of $15,000 (only one). All sponsorships come with a table of ten tickets, banner display and logo display on all materials. Higher sponsorship levels include seats on dais at lunch, additional tables, video sponsors, journal ads etc. Journal ads are also available as well. Download registration forms here. For any questions please contact our offices at info@visionlongisland.org, 631-261-0242 or contact me directly at 631-804-9128. The long-awaited construction of the new Marina Pointe East Rockaway is expected to begin in a few months, replacing the now demolished Davison Boatyard marina complex that was significantly damaged by Sandy. 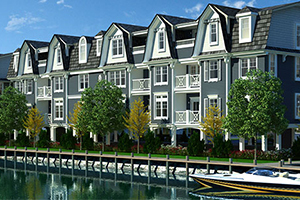 Marina Pointe will be awarded in June at the Long Island Smart Growth Awards. “We are looking forward to Marina Pointe having a positive impact on the Village of East Rockaway,” said Beechwood’s Michael Dubb. “We are transforming an outdated and storm-ravaged boatyard and marina into waterfront homes. 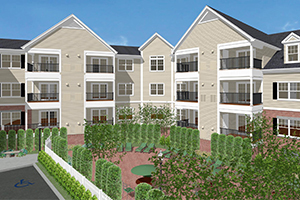 In addition to providing more housing options for Long Islanders of all ages, it benefits local businesses.” Six four-story buildings will go up by Jericho-based developer Beechwood Organization, offering 84 suites and villas within walking distance to the Long Island Railroad’s East Rockaway station. The units will be on the second floor up, allowing for parking on the ground level, which will also help make the development more resilient towards flooding, bringing the housing units above the flood plain. The site will also be grated to help with potential flooding issues. Owners will have the option towards having private boating slips, and be within walking distance of local shops, beaches, and restaurants, and the Best Market that will be opening soon to replace Pathmark. The starting price for the units will be in the mid $400,000 range, with owners having the benefit of a maintenance-free lifestyle. The project’s traffic study conducted by the developers concluded that the new development would not have a negative impact to the area. 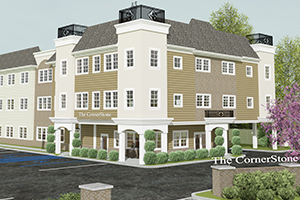 This week marked the groundbreaking for a TOD project in downtown Copiague with developer Conifer Realty, the Town of Babylon, Suffolk County and the Copiague Chamber of Commerce. 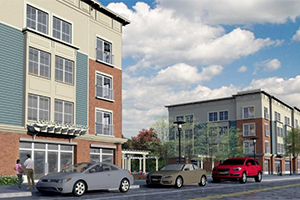 Copiague Commons, a 90 unit project, will provide housing options for Main Street and bring customers to local businesses. 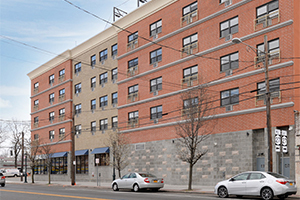 The development will consist of apartments in two four story buildings that will rent for $1,193 to $1,850 and will be aiming to accomodate tenants earning between 60 and 100 percent of median income. Vision Long Island was out in support of the groundbreaking and Conifer Realty and the Town of Babylon will be honored for Copiague Commons at the LI Smart Growth Awards in June. You can read more on this development at Newsday. Governor Andrew Cuomo announced initial public meetings for the proposed Third Track project this week. The meetings, held over two days include expedited modifications to all train crossings along the project route, and the release of a new project scoping report, website and community center. “A third track on the main line is crucial to the future of Long Island,” said Governor Cuomo. “This project will make the LIRR more reliable for millions of customers, while also eliminating multiple dangerous train crossings along the main line. Our proposal will ensure that we can continue to improve the quality of life and grow the economy in the region, and I encourage New Yorkers to learn more about how we’re working to build a brighter future for Long Island”. The expansion is expected to add a third track for 9.8 miles, between Floral Park and Hicksville. So far, a draft scoping document, which you can view here, has been released discussing options for crossing modifications and an outline of the environmental analysis. A website where the public can learn more about the project and provide input has also been launched at www.AModernLI.com . The MTA will also open a LIRR Expansion Project Information Center beginning May 6th on the south platform of the Mineola train station, where the scoping document can be reviewed and questions can be asked on Tuesdays and Wednesdays from 11am-7pm, Thursdays and Fridays from 7am to 3pm, and Saturdays from 10am to 3pm. 1) Reduced access for traffic, cross streets and due to extended construction; 2) Lower property values; 3) Construction 24/7 including evenings; 4) Question to elevation; 5) There is already an increase in freight traffic now and they expect more to follow. The good news is that there are some scheduled and should be many more public meetings to answer these questions and properly address the local concerns from the impacted communities. What is plainly clear is that the folks engaged in this decision are high level NYS officials, agency staff the local municipalities and the community. For the project to be successful other intermediaries will not have much of a role. Tuesday, May 24, 2016 from 11 am to 2 pm at The Inn at New Hyde Park, located at 214 Jericho Turnpike, New Hyde Park, NY 11040. This week, U.S. Senator Charles E. Schumer called on the Federal Highway Administration (FHWA) and the New York State Department of Transportation (NYSDOT) to unlock $2 million in previously secured federal transportation funding for the Town of North Hempstead, by repurposing an old unused earmark. Over a decade ago in 2005, the Town of North Hempstead was awarded a $2 million earmark for a repaving project on Grand Boulevard, Westbury, however, the project was completed using other funding and so, the money was never spent. Until now, federal rules blocked the reuse of funds even if the project was no longer needed. However, a newly enacted Schumer-backed law in the Consolidated Appropriations Act now gives FHWA and NYSDOT the authority to repurpose any unspent money to newer projects nearby that are needed. “The repurposing of federal transportation dollars for North Hempstead is essential to assist us in completing projects that benefit our residents and improve our infrastructure. The funding would also reduce the need for borrowing for the projects, and that’s great news for the Town and its taxpayers,” said North Hempstead Town Supervisor Judi Bosworth. Representative Kathleen Rice agrees that the funding should be reappropriated and used in North Hempstead. 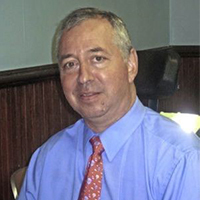 “Instead of letting this money continue to go unspent or seeing it diverted elsewhere, the Town of North Hempstead should be free to invest in other important local projects that are in need of funding right now, from upgrading roads in the Garden City Park Industrial Zone to completing the Hempstead Harbor Trail.” The Garden City Park design and engineering plan would cost $300,000, making the project shovel-ready and eligible for other funding. The Hempstead Harbor Trail project will cost $700,000, extending the trail to 2 miles. The other projects that will be the revitalization of Main Street Port Washington ($500,000), with drainage and other infrastructure improvements near the LIRR station; and completing the Plandome Road culvert, connecting Leeds Pond and Manhasset Bay. The culvert is showing deterioration, and if it collapses it will sever Plandome Road, which is a major evacuation route for the Port Washington Peninsula. The Town obtained $1.5 million in state funds, for the project, with the remaining $500,000 being needed to complete the project. The growth of multiple transportation modes, shared use of bikes and cars, and bicycle infrastructure have been driving real estate trends in urban areas, according to experts who participated in the Urban Land Institute’s Spring Meeting in Philadelphia this month. Significant progress has been made across the country in terms of the growth of multimodal systems, with 14 cities having heavy rail or subways, 28 having light rail, and bus rapid transit systems growing to be accepted in 36 cities. A third of all Americans now live in the nation’s top-ten-population cities, and 52 percent want to live in a place where they don’t have to rely on cars, Eldridge noted. Fewer vehicle trips are happening, and millennials, in particular, are choosing transportation modes besides driving, affecting how cities are being built. McMahon felt that more will bike as bicycle infrastructure becomes more advanced as 43 percent of all trips are less than three miles away. Tours were also given in some of Philadelphia’s hottest neighborhoods in different stages of development, which is being driven to a great extent by the boom in the city’s millennial population, the largest increase seen in any major city since 2006. Historical destinations as well as redeveloping neighborhoods were visited, highlighting the area’s rich history, while allowing visitors to look into efforts to revitalize. Island Harvest and the National Association of Letter Carriers (NALC) are again joining forces for the 24th-annual Stamp Out Hunger campaign on Saturday, May 14, 2016, as part of the nation’s largest single-day food drive. Postal carriers throughout Nassau and Suffolk counties will collect nonperishable food items left by caring Long Islanders who want to be part of the solution in ending hunger in our communities. All food collected will benefit Island Harvest in providing supplemental food support to the more than 316,000 Long Islanders at risk of going hungry every day. Participation in the Stamp Out Hunger food drive is simple. Residents are asked to leave nonperishable food items such as canned goods, pasta, rice, boxed juices and shelf-stable milk (please, no glass items) next to their mailboxes before regularly scheduled mail delivery on Saturday, May 14, 2016. The postal carriers will do the rest. Last year, generous Long Islanders donated 346,000 pounds of food to the Stamp Out Hunger collection event, translating into 288,333 meals to assist food-insecure residents in Nassau and Suffolk. This year’s sponsoring partners of the NALC Stamp Out Hunger collection include Stop & Shop, and the United States Postal Service. This meeting will include special guest speaker Bill Millett from Scope View Strategic Advantage who will address the “Economic Benefits of Early Childhood Education”. NYS Senator Phil Boyle will provide an Albany update and Freeport Mayor Robert Kennedy will present a proposal for post-Sand infrastructure. All are invited to join the Sustainability Institute at Molloy College and Open the Cages Alliance for a screening of the award-winning documentary Live and Let Live, part of the Sustainable Living Film Series. Live and Let Live is a 2013 feature documentary examining our relationship with animals, the history of veganism and the ethical, environmental and health reasons that move people to go vegan. Food scandals, climate change, lifestyle diseases and ethical concerns move more and more people to reconsider eating animals and animal products. From butcher to vegan chef, from factory farmer to farm sanctuary owner – Live and Let Live tells the stories of six individuals who decided to stop consuming animal products for different reasons and shows the impact the decision has had on our lives. Topics such as fair housing requirements, affordable housing planning, zoning, land use and design techniques, affordable housing financing and community economic benefits will be covered. 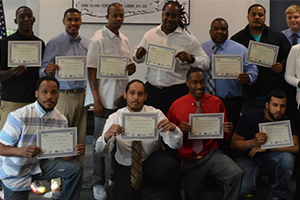 As part of St. Joseph’s Center for Community Solutions, the Institute of Attainable Homes aims to support the growth of sustainable communities through intentional development and revitalization of homes, neighborhoods and communities in order to meet the needs of new residents, and ensure access to a good quality of life for all Long Islanders. A constant struggle for communities on Long Island is the fight to have New York State bring back a portion of the MTA tax that employers are paying without receiving any local benefits. Attached are two proposed companion amendments to the Metropolitan Commuter Transportation Mobility Tax, also known as the “MTA Payroll Tax,” that have been introduced in Albany this year, Senate Bill #7294 introduced by Senator Martins (2015) and Bill #9725 introduced by Assemblyman Ramos and sponsored by Assembly members Solages and Thiele. These changes to the existing MTA Payroll Tax structure would provide Long Island with significant new funding for vital transportation investments, helping to alleviate the burden of tight budgets on municipalities. To date, employers in the counties of New York (Manhattan), Bronx, Kings (Brooklyn), Richmond (Staten Island), Queens, Nassau, Orange, Suffolk, Rockland, Putnam, Dutchess, and Westchester, have contributed nearly $1.5 billion dollars to the MTA. Communities outside of New York City do not receive a proportionate benefit for the contribution paid by local employers. The amendments call for using MTA Payroll Tax dollars to bring the downstate counties to a 50% local match of the operating costs of public transportation. This will address some of the existing inequity in Nassau and Suffolk without hurting the other counties. Both County Executives, as well as a large and growing number of local elected officials, employers, local chambers of commerce and residents strongly support this change. Please contact your New York State representative in the Senate and Assembly, urging them to support these amendments. Applications are now being accepted for entry into a lottery for 1-,2-. and 3-bedroon Limited Equity Co-ops in Melville. The newly constructed two- story townhome buildings are located on Ruland Road in Melville, NY. They will include one, two, and three bedroom units with a veteran’s preference, as well as mobility and hearing impaired units. The property is located in the highly ranked Half Hollow Hills Central School District with retail shops and transportation nearby. 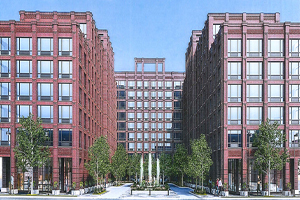 The project amenities in each unit include Energy Star appliances, central air systems, and accessible parking for tenants. 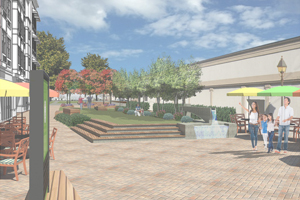 The project also will include a tennis court, clubhouse, outdoor play area, and garden space. To be eligible for Limited Equity Co-ops, all prospective owners’ incomes must be verified and certified by onsite housing staff. Monthly Maintenance ranges between $1106 and $2063 a month, with annual income ranges between $37,920 and $92,400. The United States Department of Agriculture (USDA) is now accepting applications for their Conservation Innovation Grants (CIG). The CIG focus for Fiscal Year (FY) 2016 is Water Quality and Conservation Finance. The total amount of funding for the program will be up to $20 million. Conservation Innovation Grants (CIG) are competitive grants that stimulate the development and adoption of innovative approaches and technologies for conservation on agricultural lands. CIG uses Environmental Quality Incentives Program (EQIP) funds to award competitive grants to non-Federal governmental or nongovernmental organizations, American Indian Tribes, or individuals. Producers involved in CIG funded projects must be EQIP eligible. 10 percent of CIG funding will be set aside for projects benefitting historically underserved producers, farmers or ranchers who are military veterans, or organizations comprised of or representing these individuals. Applications are due May 10th. For more information, click here. The Federal Transit Administration (FTA) is now accepting applications for the grant funded Bus and Bus Facilities Program. A total of $211 million will be available for this year’s grant opportunity. Tribal, state, county, city and township governmental entities may apply. The purpose of the Bus Program is to improve the condition of the nation’s public transportation bus fleets, expand transportation access to employment, educational, and healthcare facilities, and to improve mobility options in rural and urban areas throughout the country. In accordance with the statutory requirement that FTA must “consider the age and condition of buses, bus fleets, related equipment, and bus-related facilities”, FTA will prioritize projects that demonstrate how they will address significant repair and maintenance needs, improve the safety of transit systems, deploy connective projects that include advanced technologies to connect bus systems with other networks, and support the creation of ladders of opportunity. The Long Island Regional Economic Development Council next meeting will be Monday, May 9, 2016 at Hofstra University, David S. Mack Student Center where a representative from the New York Department of State will be presenting on the Downtown Revitalization Initiative and will take questions from the audience. Registration for this meeting can be found at http://regionalcouncils.ny.gov/content/liredc-meeting-may-9-2016 . 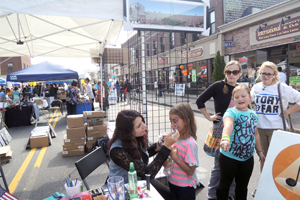 As a movement, folks who support smart growth and downtown redevelopment on Long Island have been shifting away from regionalism for some time largely because consensus can be and is achieved on a local level. The public trusts their neighbors, small businesses, local mayor or municipality at higher levels than the divisiveness and chaos on the national level or other big governments, entities and interests. Downtowns are best planned and managed locally - not from afar. "How is bigger administration, with labyrinths nobody can comprehend or navigate, an improvement over crazy-quilt township and suburban governments?"